These days, big-screen smartphones are loved by most of the people across the globe. While some feel nostalgic when they hear about a small screen smartphone, same as the Nokia 3310 (2017). Well if you're one among them, here's a nostalgic moment for you. 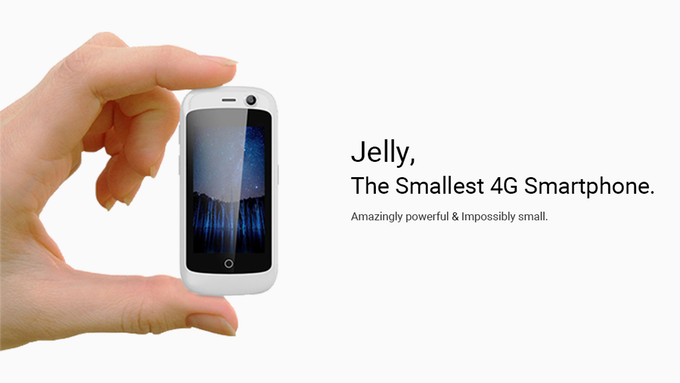 Jelly is the world's tiny smartphone with 4G support. It has a 2.45-inch screen with a resolution of 240 * 432 pixels, which nowhere comes near to most handsets out there in the market currently. Although it bears a small screen, the phone packs a punch internally. It boots Android 7.0 Nougat, and you can use almost every app which is present in the Google Play Store. The device packs a 1.1GHz quad-core chipset and comes in two variants- one with 1GB of RAM/8GB of native storage and the other one with 2GB of RAM/16GB of internal storage. It comes with connectivity options such as 4G LTE, VoLTE, Wi-Fi, Bluetooth, and GPS. Both the variants come with 8MP of primary camera and 2MP front-facing camera. Finally, the phone has a 950mAh battery fuelling the entire package. Unihertz is a China-based company, but being a Kickstarter project, the device will be shipped internationally. For now, the estimated date of shipping is August 2017 with a price of $59.